The return ticket for my unplanned journey to my hometown was booked over phone through a contact. The ticket was for Shama’s Pathanamthitta-Bangalore service. In the few days before my journey, I was busy finding out which bus would I be travelling in. I found out that it would be a bus that I had travelled earlier in – I was a bit disappointed. August 06, 2012: It was one heck of a day. I was busy throughout, and time was running out quickly. I reached home only around 1900hrs, and had to leave by 2000hrs to make it to Thrissur on time for my bus. I left home a while past 2000hrs, and my brother dropped me at Thrissur. I headed straight to the travel agent, and paid the money for my ticket. I had the choice of selecting a seat – and I took a window seat on the first row. Just a while after getting my ticket, my contact called me and informed that I would be getting a brand new bus! I certainly was excited. 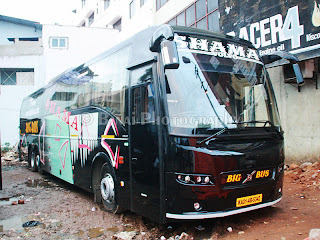 Shama Transport is a Bangalore based operator, operating only to Kerala. They operate to Ernakulam, Pathanamthitta and Trivandrum (via Alappuzha as well as via Nagercoil). They recently bought some new buses for replacing their aging warhorses. 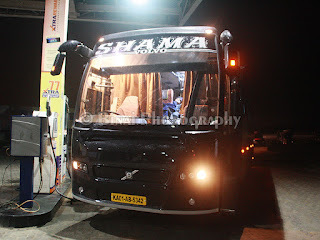 Shama is pretty quick, and they have a good number of regular passengers – they buses are decently maintained (there are exceptions – refer to my earlier review for a very bad experience of mine). Crew are a mixed lot – but they would be good to you, if you are good to them. My bus was at 2130 – there was no sign of the bus even at 2125hrs. Around 2128hrs, I saw a shiny black bus curving through to the travel agents’ office. It indeed was a brand new bus. The bus stopped and boarding started. The bus still had the characteristic “new vehicle” smell inside – seats still had plastic covers on it, and carpet was yet to be installed. My seat number was “A”. I took my seat, while the agent was listing out where all the passengers were to be picked up, and settled the cash. There were a total of 14 passengers boarding from Thrissur, of which 4 were from this agent, and the remaining 10 from the next agent. While the conversation was going on, another 9 passengers got into the bus. Now we had 36 passengers in the bus. They were calling up the other passenger – who was still away. The driver was getting increasingly impatient due to the delay. Sometime later, the agent asks the driver to start – and informs the missing passenger that he would be accommodated in the next bus. The bus started off from Diwanjimoola in Thrissur at 2151 – about 21 minutes late. The driver entered Thrissur round, and headed straight towards Mannuthy. I was expecting the bus to go through Shoranur – but the driver had other ideas. He reached Mannuthy quickly – there was no pick-up there. Then the bus headed towards Kuthiran – I was a bit concerned since the road conditions were really poor and there were high chances of a traffic block. The road turned from bad to worse as we neared Kuthiran. Kuthiran is a small pass along the border of Thrissur and Palakkad districts. The pass is not very steep, but is steep enough to trouble trucks. Our speed reduced as we neared Kuthiran. It was potholes everywhere – the bus was rocking all the time. There was a mini snarl on the ghat – not as bad as I had expected, though. The movie got over a while after we passed Kuthiran – the cleaner switched off the TV and closed the curtains. The night lamps remained on. I was travelling in the first row for a night journey after some 5 years – adjusting to the seat was a bit difficult. I somehow found my convenient posture and slowly slipped into sleep. I woke up just as the bus hit a rough patch near KK Chavadi. I heard a B9R sound – quickly moved the curtain to see a Kallada B9R rushing off. Soon, the bus pulled into a petrol pump, just before the start of Coimbatore bypass (near Madukkarai) at 0035. I got off the bus and took a stroll. Then it was clicking time – went around the bus taking snaps of the bus. Had a short chat with the cleaner – a friendly guy. The bus already had a broken front windshield – a case of air crack. 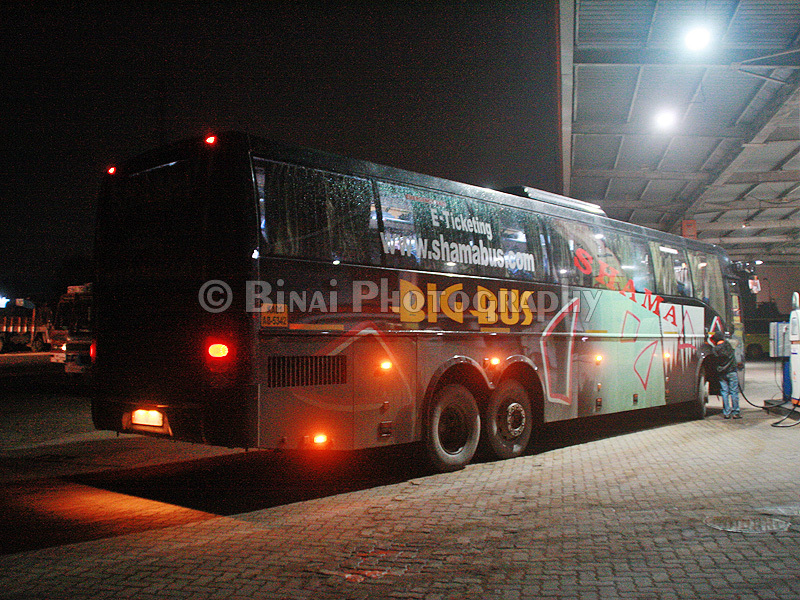 The bus took in 407 litres of diesel, and we started off at 0050hrs. Just as we started moving, the Kottarakkara-Bangalore Kallada G4 pulled in. The bus got into the bypass, and took a right towards Palladam. I learnt later that the bus regularly takes the CBE Bypass-Palladam-Tiruppur-Perundurai route now. I slept through the run – and woke up just when the bus stopped at Dharmapuri for a tea break (0407hrs). Another driver got in here, and we started off at 0414hrs. I slept off as the bus started moving. I slept uninterrupted till around 0530hrs – just as the bus stopped for someone to get off at Hosur. We reached Attibelle toll around 0545hrs – like always, the toll gate was chock-a-block with vehicles. Thankfully, the lane we chose was relatively free, and we got moving in about 10 minutes. The bus stopped outside Narayana Hrudayalaya (0615) to drop a few passengers, and later near Electronic City (0622hrs). After E.City, the bus took the elevated highway, and the driver let the beast stretch a bit. The bus reached Silk Board at 0629hrs – I was the only one to get off. The auto drivers there were a bit disappointed since I bargained hard and no other passenger got off from my bus! While travelling towards my house, I saw two more Shamas and a couple of KPNs heading towards Madiwala. The ride took 8 hours and 38 minutes. The bus took 41 minutes more than my outbound – but this bus went through Kuthiran, and had one refuelling break as well! Some points: The bus (KA-01-AB-5342) had just 2000kms on the odo! It had run one Bangalore-EKM-Bangalore trip over the past two days, and was on its second trip then! The blankets provided were of decent size – not the narrow shawls. The bus was about 30 minutes late compared to their mentioned arrival time – but that is pardonable considering the fact that the bus is new. The bus was picking pace slowly, and did not exceed 100kmph at any point of time. The bus was mint fresh – no point in writing about the maintenance. The interiors were bare – no mats. The plastic covers on the seat were still not removed. Shama does not install musical horns in their buses – so no irritating honking at night. The drivers were sane – no rash driving or braking. I liked the style of driving. The crew did not have uniforms (they are getting uniforms now). Will I take this service again? It surely is a good option for me. My current requirement is to reach Silk Board before 0630hrs – any bus that achieves this is a good option for me. Nice and detailed reviews. I do visit your blog daily for finding new updates especially bus travel reviews. Is Shama anyway related to Shama Sardar Travels? This operates some high priced services between Bangalore, Chennai etc..
Shama and Shama Sardar is not related. The former is based in Bangalore and the latter in Chennai. Shama owns their buses, while Shama Sardar does not own any buses - they take buses on lease. Nice to see the comments on disciplined crew and responsible management who does not permit music horns. I think we all need to appreciate such civilized people, to keep them motivated. They should know that their efforts are not going unnoticed.